It’s tough to make an original film these days and maybe even tougher in the genre of science fiction. The classics are just so iconic and variations on the story about first contact between humans and otherworldly life have included friendly contact, war and something else. Ones where aliens so above us in technology and understanding that we’re just left to ponder and wonder. Once that story is told perfectly what else is there to tell. Think Contact in comparison to 2001: A Space Odyssey or Independence Day in comparison to The Thing or Close Encounters of the Third Kind. Director Denis Villeneuve (he’s so hot right now) and screenwriter Eric Heisserer have not created a new fabric but they have stitched together elements from all these classics and a few new things to make something unique and perhaps most appropriate for our time. This is a sombre film that shows dreary landscapes and sees no excitement in spectacle while effortlessly rendering it. This is a film interested in big ideas but mostly shot with a sense of intimacy often in interiors and with close ups of the actors. Appropriately it opens with a mother telling her daughter the story of her life and watching her die in hospital of cancer. It is intimate and it is moving, nothing quite tugs at the heart strings like parent caring for a dying child and the audience’s shared sadness hints at one aspect of our common humanity. The mother is linguist Louise Banks (Amy Adams) in a performance that hopefully along with American Hustle sets Adams up for the second part of her career. She’s played vixens and she’s played cute but here she plays strong, maternal and intelligent and perhaps most key – mature. Aliens appear in massive shell-like vessels that hover around the planet in 12 locations. The US Military arrives in the form of Colonel Weber (Forest Whitaker) at Banks’s university and recruit her to help them at a site in America. She is to work alongside theoretical physicist Ian Donnelly played by Jeremy Renner who has a more playful personality than everybody else he seems to be working with. 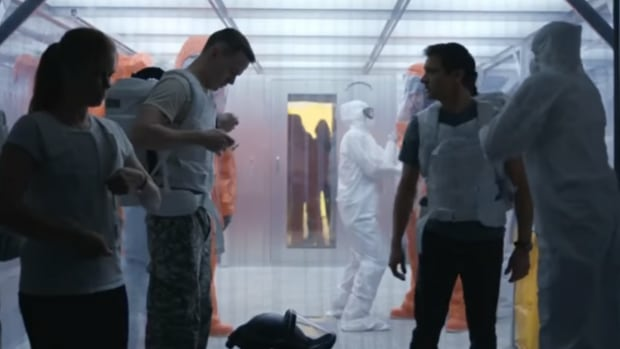 At the site they are introduced to Michael Stuhlbarg’s Agent David Halpern who it is suspected works for the CIA and is more cautious as to what is the potential harm that could be rendered by the arrival of the alien vessels. To reveal more of the plot would be sacrilege, although most promotional materials have already revealed you will see the aliens it is important to note that the film takes it time in introducing them wanting to present the scope and magnificence of their presence but also the mundane and banal conditions of the base that is set up near the vessel in America to investigate it. I for one wondered why the U.S. would place so many personnel near the vessel at the bottom of flat valley rather than helicopter people in from further away on higher ground but maybe they figured the aliens have already proven an ability to travel fast enough to sneak up on them anyway so why not save a few bucks on petrol. It feels right and real that contacts with aliens would be set up in a tent city with dimly lit rooms and the lime green shading of a hospital full of tired middle aged bureaucrats questioning each other’s ideas on a regular basis. The aliens themselves are always seen with a sense of wonder (their design is original and interesting too), how to get to them starts off in a simple fashion but is suitable otherworldly and unnerving. As the film progresses the emotional arc of Louise dealing with her daughter’s death and the mystery of the aliens start to develop and the stakes get higher. Villeneuve has crafted a classic sci-fi tale here that deals with big ideas but goes back to questioning what is humanity and where are we headed in the distant future. There are twists that do not cheat, that have groundwork lay for them before hand and that are very satisfying but one development in the third act does not feel so profound and you may be left with more questions than satisfactory answers concerning one male character. Yet something unique and emotional has been crafted here that will stand the test of time. Close Encounters of the Third Time may remain the best example of the genre of first contact with alien life. Steven Spielberg always laments though that of all his films it is the one that ages him. The lead character is a father who leaves his family to be with the aliens. Spielberg made the film as a young man and since becoming a father he has learnt no parent would ever give up being with their child – no matter what. Arrival is a film made by people who know this to be true. I actually went to the cinema to see this! A rare event in Beetley, I assure you. I liked it a lot, and reviewed it on my blog too. Truly, one of my favorites of the decade. Wonderful, heartfelt science-fiction of the type you compare this to. Fine review of a modern classic, Lloyd. Thanks mate, I feel I’ve lost my review mojo but I keep plugging away. I’m glad you liked it and the film too. If you write this well when you’ve lost your review mojo I look forward to your posts when you get it back. I haven’t seen Arrival but you make an interesting point about it setting the scene for the second part of Amy Adam’s career. There’s no limit to what she can do in the next few years! Great actress. I don’t know I feel like I had the bull by the horns when I wrote say the review of Youth. I read a review I did for Hail, Caesar and it just felt like it covered more ground but in a quicker clearer fashion. If you are guys are still enjoying it, I guess I got nothing to worry about. Thanks Paul. I think that this is a good review too. No mojo missing here in my opinion!! It is difficult to come up with new sci-fi when our technology keeps catching up with it, but this sounds pretty good, Lloyd. Thank you John, I also checked out your list. Interesting individual choices that champion those films. Great stuff, Lloyd. Couldn’t agree with you more! Thanks Cindy. I wonder what your Top 10 for 2016 would be. Awesome stuff, gotta watch this one again!